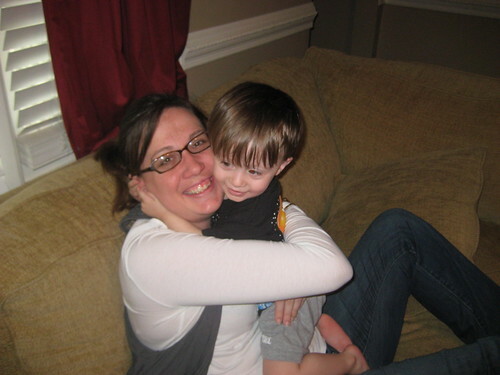 Henry has recently become the best giver of hugs in the history of toddlers. If you ask for a hug, or a "big squeeze" he takes your entire head into his arms and squeezes with all his might. Letting out a little "Ehhhhhh" as he does it, just to show you how much love he is packing in to this particular Big Squeeze. My big squeeze yesterday morning was the best Mother's Day present I could have ever gotten. I am so very lucky to have my boys. Nick cleaned the entire house yesterday, kept both Henry and Cici while Boo and I had family stuff to take care of, took me and Henry out to a great dinner and surprised me with chocolate covered strawberries and pretzels when we got home. It was a good Mother's Day. I am so very lucky to have my boys. I'm glad that you had such a wonderful Mother's Day. There's nothing quite as special as though big hugs! I am awarding you the "The Versatile Blogger Award" :) Do check out my link http://ivfsingapore.blogspot.com/ for more info. very sweet!!! He loves you! !